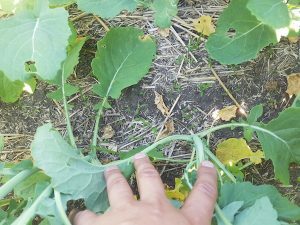 If canola plants start to look funny after herbicide spray season, it could be that residues were stripped from the sprayer tank and plumbing, or that spray drifted in from another field. The following images show typical symptoms of foliar herbicide mishaps. Can you name the herbicide group that caused the damage? 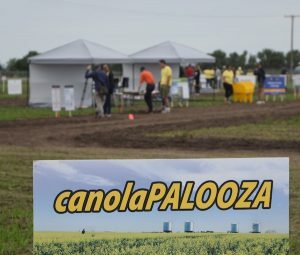 Attendees at canolaPALOOZA in Saskatoon, Portage la Prairie and Lacombe could write their own Top 10s and come up with completely different lists from ours. This is ours. Sclerotinia stem rot: Dry early, now moist. What’s the risk? 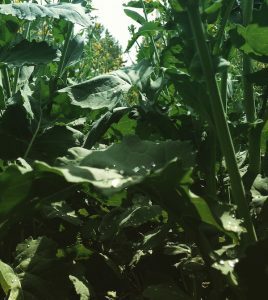 If conditions were dry, then turned wet, the sclerotinia risk depends on when this transition occurred. Early dry weather doesn’t matter as much as long as you have moisture within the canopy leading up to and during the flowering period. As a rough estimate, the 20% flower or “bloom” stage is when the main stem has around 15 “flowers”. 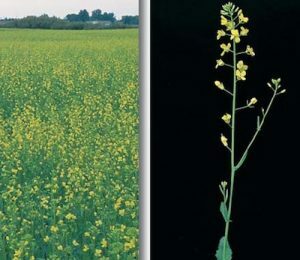 Canola can reach 20% bloom in 4-5 days after first flower. Late June frost: What to do? Parts of Saskatchewan had frost this week! The message for a late June frost would be similar to a frost early in the spring: Wait to assess crop regrowth, and hope that at least one plant per square foot survives. The key difference is that by late June reseeding really isn’t an option. 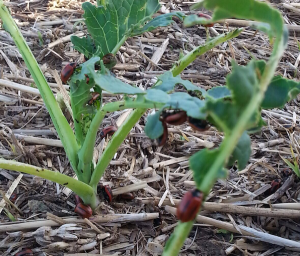 Red turnip beetles are eating large patches in a few fields in central Alberta. 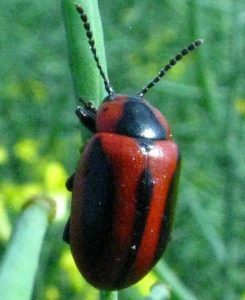 Red turnip beetles eat plants from the brassica family only, and they are sometimes — though rarely — an economic pest in canola. 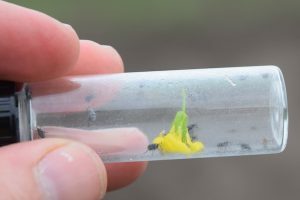 Cabbage seedpod weevils move to canola fields at the bud to early-flower stages. 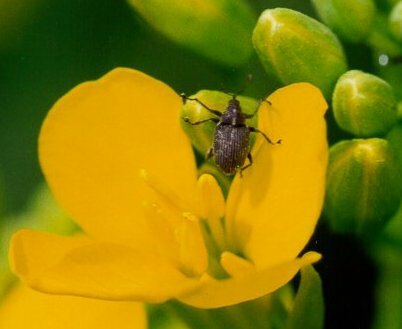 While they will feed on buds and destroy some of them, spraying is rarely recommended before 10% bloom. 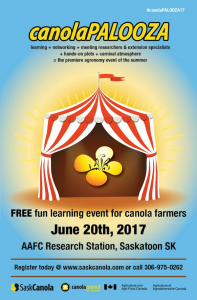 These five questions are based on tips and recommendations gathered at canolaPALOOZA in Saskatoon this week. 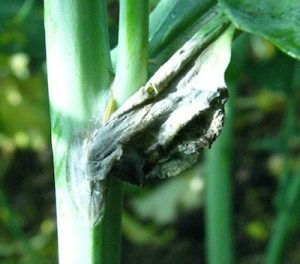 Prevalence of sclerotinia stem rot has a direct correlation to above-average moisture. If a field has regular rains or high humidity or both from two weeks before flowering and through flowering, then infection will likely occur. If growers decide to spray, the window for most products is 20-50% flower. Earlier is usually better as early infection on the main stem tends to cause the most yield loss. Is a second herbicide application necessary? Can you go 4 for 4 on this worm-themed quiz? 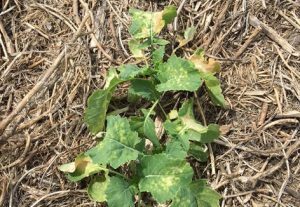 Here are some agronomy-related questions that dig a little deeper into herbicide performance in canola….